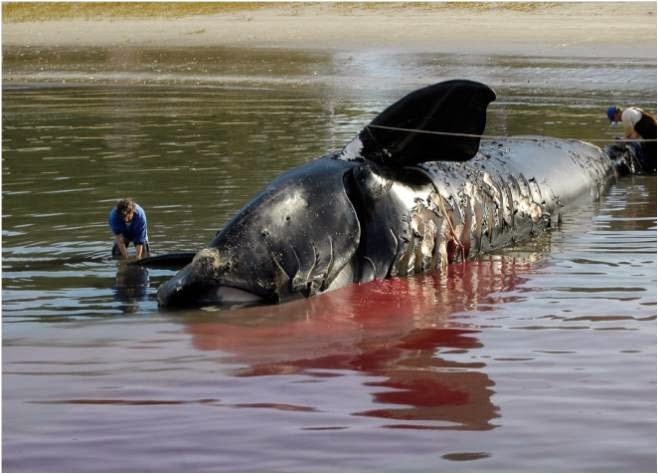 Large whales are vulnerable to collisions with vessels throughout the world's oceans. North Atlantic right whales inhabit the coastal waters of the Eastern Seaboard of North America, and their migratory route between their feeding grounds in the Northeast and their calving ground in the Southeast passes some of the busiest ports in the US. This makes harmful and often deadly vessel interactions inevitable. 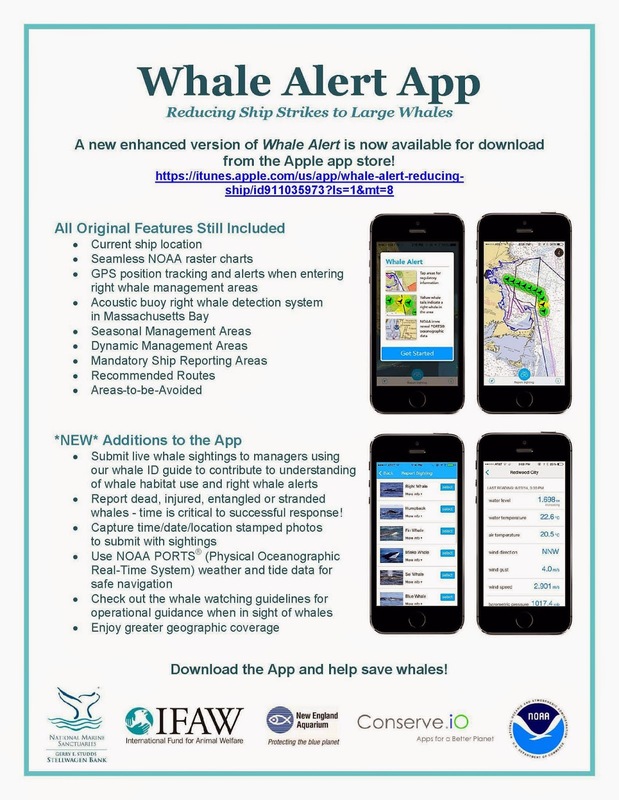 Whale Alert, launched in April of 2012, is a free iPhone and iPad mobile application developed by many stakeholders, including the New England Aquarium, with the common goal of reducing lethal vessel collisions of endangered North Atlantic right whales. The application was designed to provide a “one-stop shop” for mariners to access all US vessel strike reduction regulations as well as dynamic conservation measures implemented from recent whale sightings. Whale Alert was downloaded by 15,000 users its first week and reached a larger and more diverse audience than anticipated! Due to the interest in the application, developers recognized a need for a more advanced version. 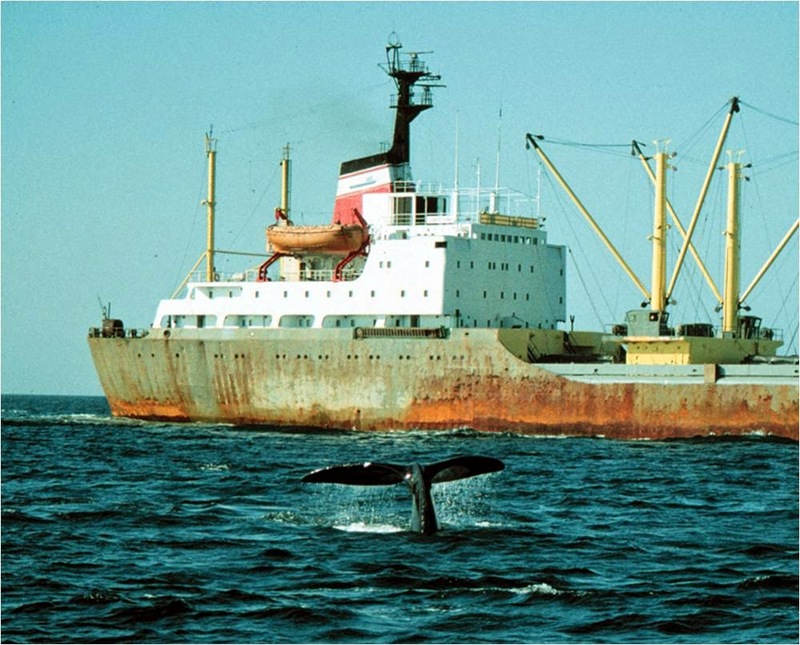 Whale Alert 2.0 was released in October of 2014 and transformed the application from an information hub developed for the shipping industry to an international, interactive two-way user interface. In addition to providing the original functions, Whale Alert 2.0 now provides vital new features for mariners and a platform for citizen science! The app has expanded geographic coverage to include Western US and Canadian coastal waters and also provides users with an interface for reporting sightings of live and distressed whales. Professional mariners and the public can now contribute to international efforts to reduce vessel strikes by contributing sighting data for right whales, humpbacks, fin whales, gray whales, and more through the in-app whale sighting report feature. The geographically smart app provides users a platform to accurately identify and report live whale sightings, but more importantly, allows for reporting sightings of dead, entangled, or stranded whales. 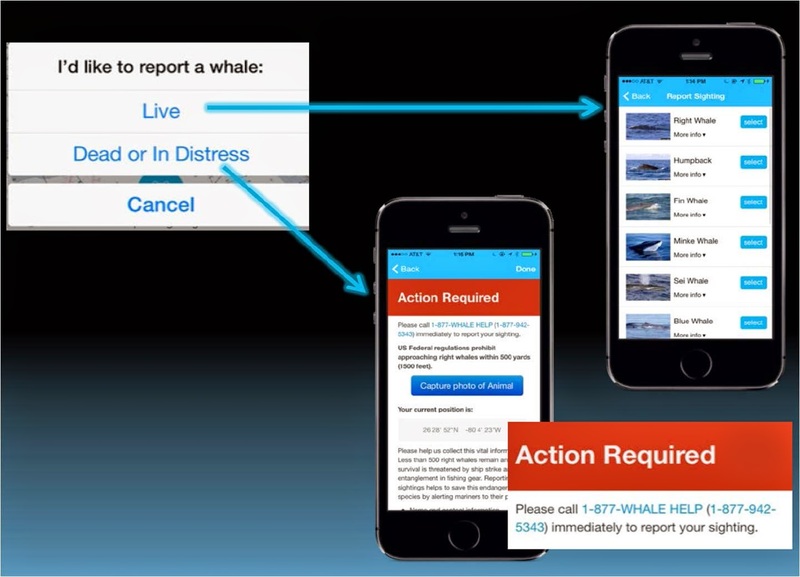 When a user reports a whale in distress, the app will automatically direct the user to the appropriate government agency or response group based on their GPS location, expediting response to whales in peril. This allows for users to play a direct role in marine conservation science and could potentially save the lives of endangered whales along international coastlines! Screenshots from Whale Alert 2.0 showing how to report whale sightings through the application (Wiley et al., 2015). Whale Alert is a revolutionary mobile application that has evolved from a method of just delivering information on regulations and right whales to East Coast US mariners into a multifaceted two-way user interface, bridging gaps between the shipping industry, scientists, and the public to help whale species both nationally and internationally. 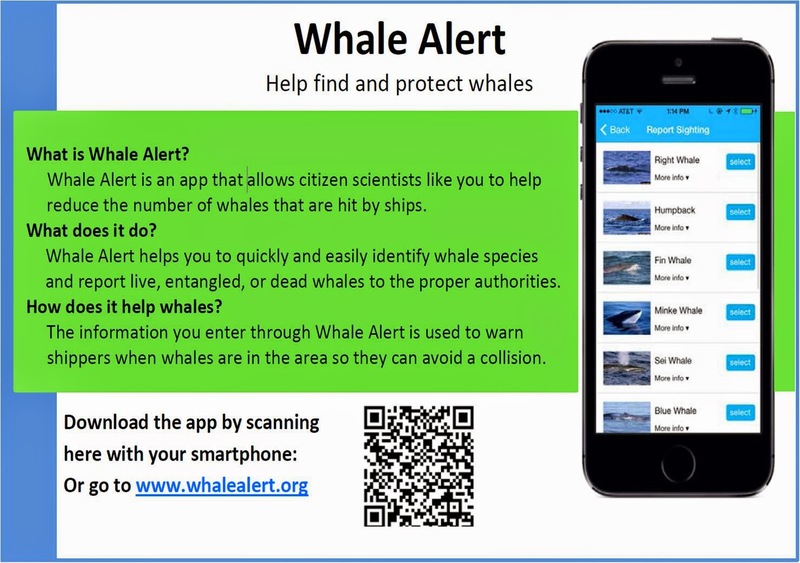 Read below to learn how you can download Whale Alert 2.0 and start participating in citizen science to help save endangered whales today! Whale Alert 2.0 is an entirely new and improved application. New users and those still operating the original version are urged to scan the bar code below or go the iTunes store and download the new version in order to benefit from all the enhanced features! Whale Alert for Android phones is coming this spring. You can learn more at www.whalealert.org. Images from: Wiley, D., Argenault, R., Brown, M., Carver, M., Ramage, P., Schwher, K., Thompson, M., Winney, B., & Jahncke, J. (2015). Whale Alert: Dynamic Ocean Management to Reduce Collisions between Whales and Ships [PP slides].